I wasn’t expecting that the expansion of nominees in the general field at Grammys 2019 would do anything to help my accuracy when predicting back in October, but I’ll take 4/8 here. 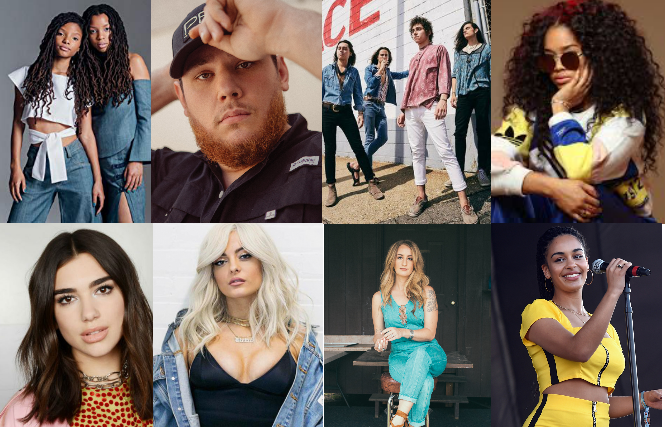 Best New Artist is usually home to some of the breakout stars of the year, but given some particular names not being eligible, we are left with an interestingly diverse shortlist that could pretty much go any way. All but 3 of the acts below have more than one nomination this year, so it’s really anyone’s game. Let’s start with those ommisions. We already knew Cardi B and Post Malone were ineligible, despite Bebe Rexha making it in who had her first Billboard Top 10 in 2015(! ), but the exclusion of Ella Mai is even more surprising. Nominated in the Song of the Year category for monster hit Boo’d Up she was my clear frontrunner for this trophy, so It’s opened up a space for another act instead. Perhaps the RnB leaning selection above shows why she missed out, in fact the list is specifically split into RnB, Country, Pop and a single Rock anomaly. This anomaly could perhaps take the trophy thanks their Led Zeppelin sounding performance, but Greta Van Fleet are probably my least favourite of the acts nominated this year. It feels like a throwback in a bad way, especially on songs like Black Smoke Rising. I’ve mentioned her already, but as part of the pair of female pop acts nominated this year, I don’t feel that Bebe Rexha has done enough to solidify her as a true star. Even on the likes of Meant To Be it’s Florida Georgia Line that make the song theirs, I still don’t feel like I’ve heard a song and thought, that’s a Bebe Rexha song. Dua Lipa on the other hand may be much earlier into her career, but a string of brilliant songs including IDGAF, the now Grammy nominated Electricity and inescapable hit New Rules makes her one of the out and out favourites for me here. Moving over to the pair of country nominees we have two very different takes on ‘classic country’, Luke Combs very much stuck in the last decade following on directly from the likes of Luke Bryan and Jason Aldean, while Margo Price is pulling directly from Loretta Lynne and Dolly Parton for her much more traditional country style. Interestingly the modern country is so much more my bag, so Luke Combs would be the obvious pick here. His place as the genre’s current ‘leading man’ with a string of #1 hits in a row, while being one of just two male artists in the category puts him right up there as a favourite for the prize too. I could see the Pop/RnB fan vote being split so much that Combs just slides in past them. That leaves the final genre, RnB that all sit quite nicely together on the playlist I was listening to while writing this article. The most surprisingly nominee of the lot, the Brit Award winning Jorja Smith fully deserves her spot after releasing one of the year’s most consistent RnB albums. She’s by far the least known act in the US mentioned above, but her recent nomination for Best British Album at this year’s Brit Awards goes a long way to show how much she is adored critically. She sits right ahead of the duo Chloe x Halle who were a group I had heard of, but never actually listened to before this nomination. They have a youthful energy between them that sticks them apart from the rest of the acts here, but sadly I think in a crowded category of RnB they will probably be lost. That leaves one final act, who wasn’t even on my radar for a nomination until every other set of predictions listed her right at the top. H.E.R. is not only nominated here, but she is nominated in Album of the Year, interestingly for a compilation of 2 EPs and not a singular album. With 5 nominations in total, she looks to be the clear frontrunner for the trophy here. The music is so atmospheric and surprising at times too, I haven’t heard an RnB act have this much mystery in the way they perform their music since The Weeknd’s debut back in 2010. Of course, I said much of the same about SZA in this category last year and given her 0/5 for wins in the end, perhaps it won’t be the night for H.E.R. either? Tags: Bebe Rexha, Chloe x Halle, Dua Lipa, Grammys, Grammys 2019, Greta Van Fleet, H.E.R., Jorja Smith, Luke Combs, Margo Price. Bookmark the permalink. H.E.R or chloe x halle for best new artist!